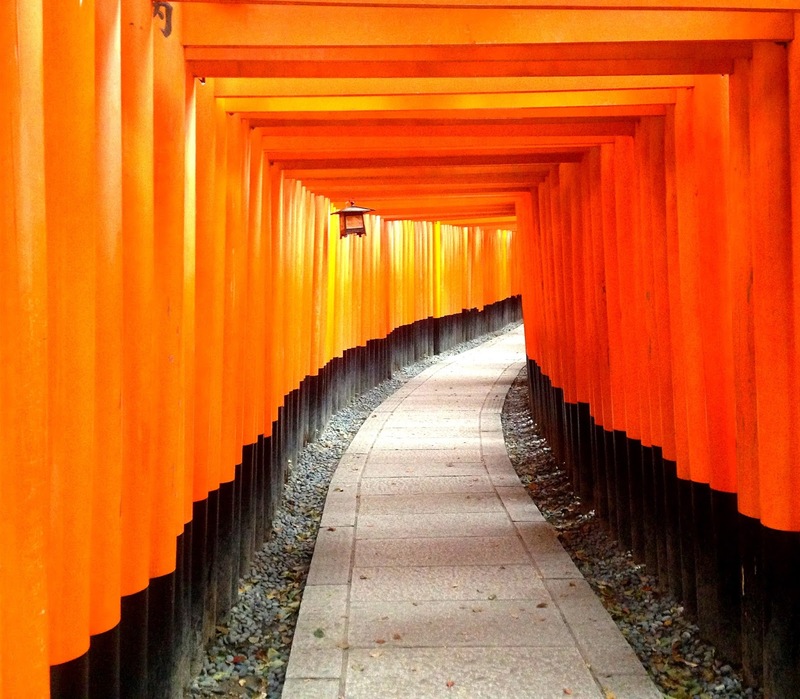 It was an early 5am start for us this morning as we wanted to go see the Fushimi Inari shrine and I wanted to do it before anyone arrived. 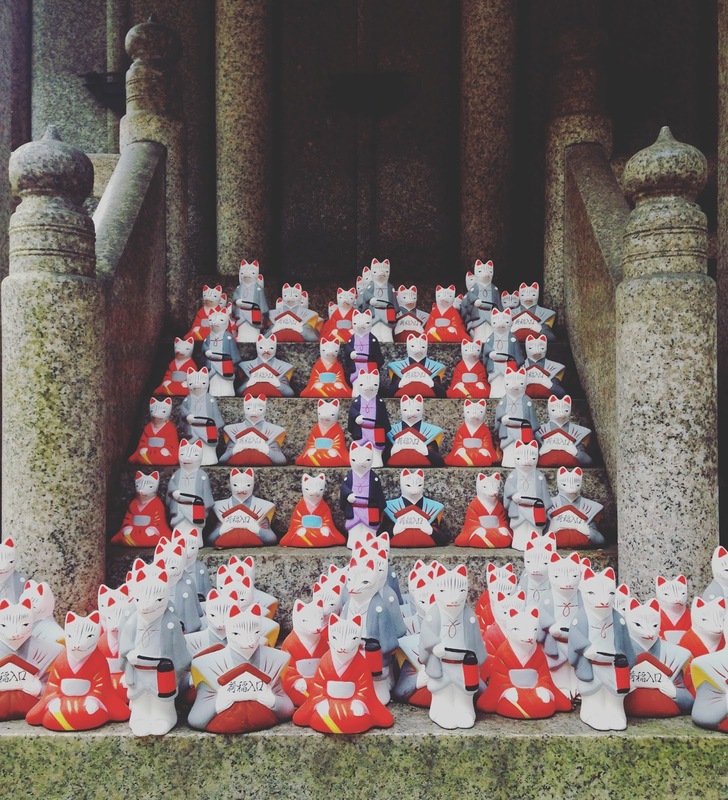 I did have to question if getting up that early to see a shrine was a bit mental but it was totally worth it and I would advise anyone to do the same! We were outside the shrine by 6.30am with not a soul in sight. 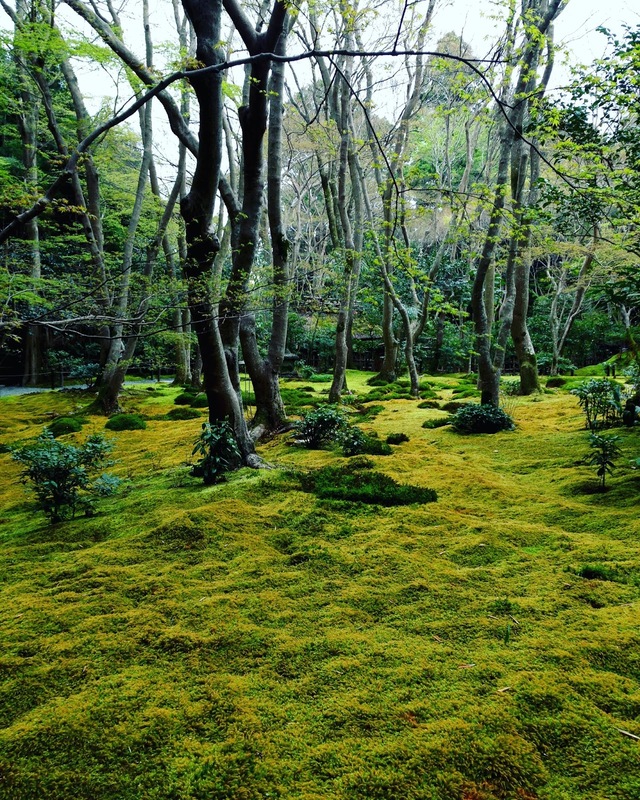 There is certainly something quite ‘zen’ about an experience like that. 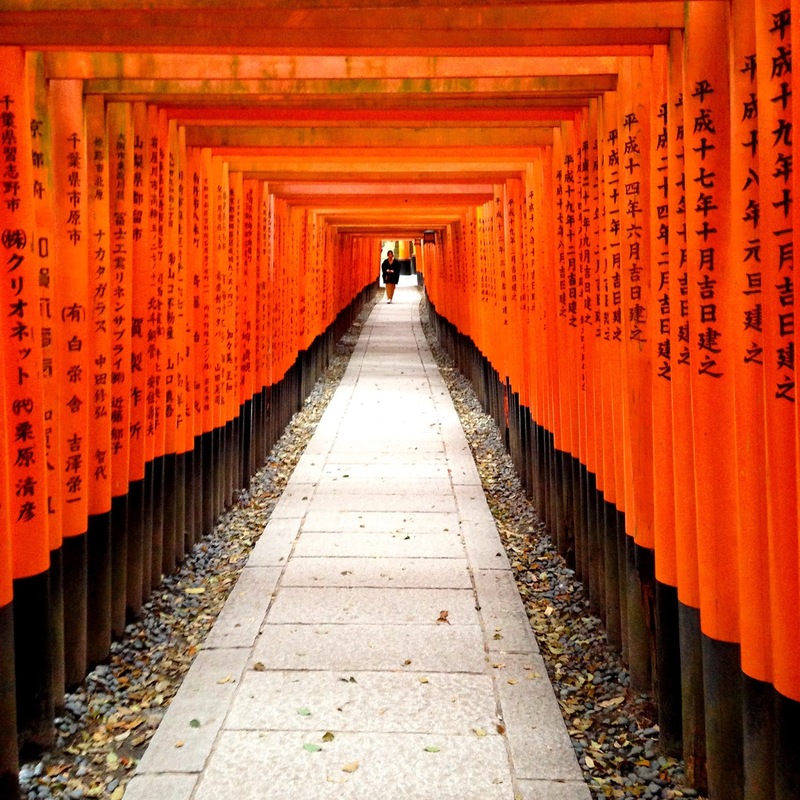 The shrine is famous for the thousands of Tori gates which lead up Mount Inari. It really was such a sensational sight and I was so pleased with my photos. The idea may have been simple but the outcome was so beautiful. We wandered up and then we came to a forkway. We got a bit lost and ended up coming back down again, rather than continue to a point which was meant to give an amazing view over Kyoto. Oh well! We timed it well because as we left, around 8am, the shrine had started to fill out and had we arrived at that time I think our chances of getting any photos without tourists in would have dramatically decreased. We hoped on a JR line over to Arashiyama, a district in Western Kyoto. The area was really beautiful, it had mountains and a river and a real traditional feel to it. From the station it was a short walk to cross Togetsukya Bridge and head up the hill to the amazing Iwatayama monkey park. The park is situated on Mt Arashiyama and it was quite a climb, it takes about 30 minutes to hike up. The hike was totally worth it when we got to the top. There are about 170 wild monkeys that live on the mountain and we were able to watch them as they jumped around, played and lazed nearby. 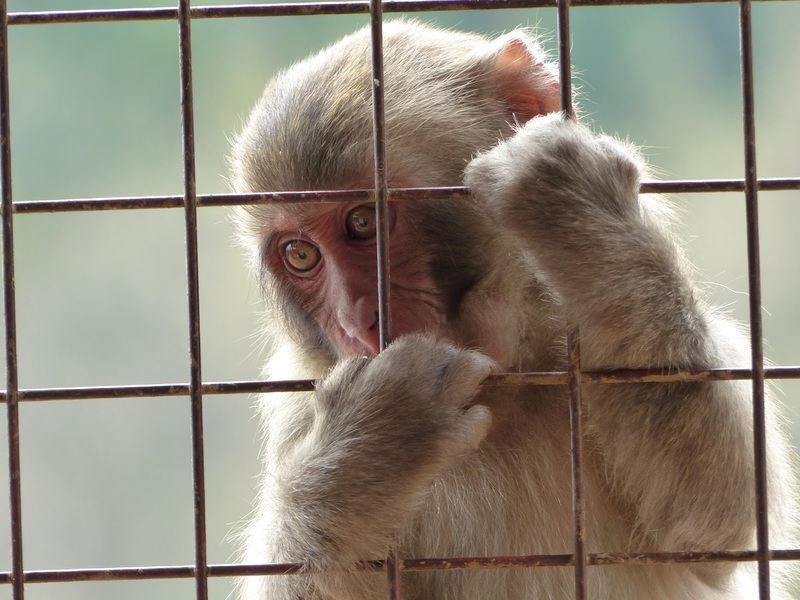 There were lots of notices around warning people not to make eye contact with the monkeys but they generally seemed unperturbed by our presence and people were able to get some really close photos. I enjoyed watching the baby monkeys playing around the pool, trying to catch the big koi carp (unsuccessfully). At the top of the mountain we were also treated to some amazing views over Kyoto, we were luckily to have enough gorgeous day full of sunshine. 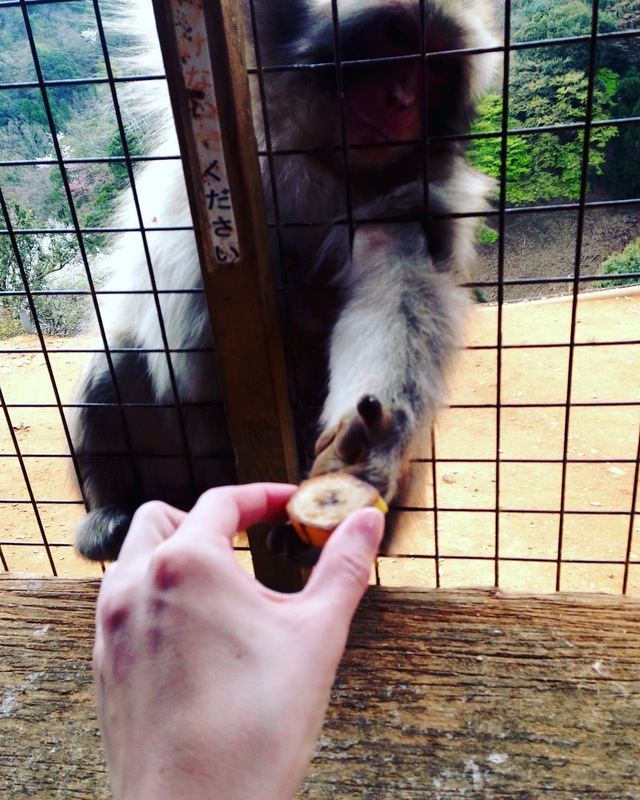 Then one of the highlights of my trip, feeding the monkeys! This was novel as WE got inside the cage. 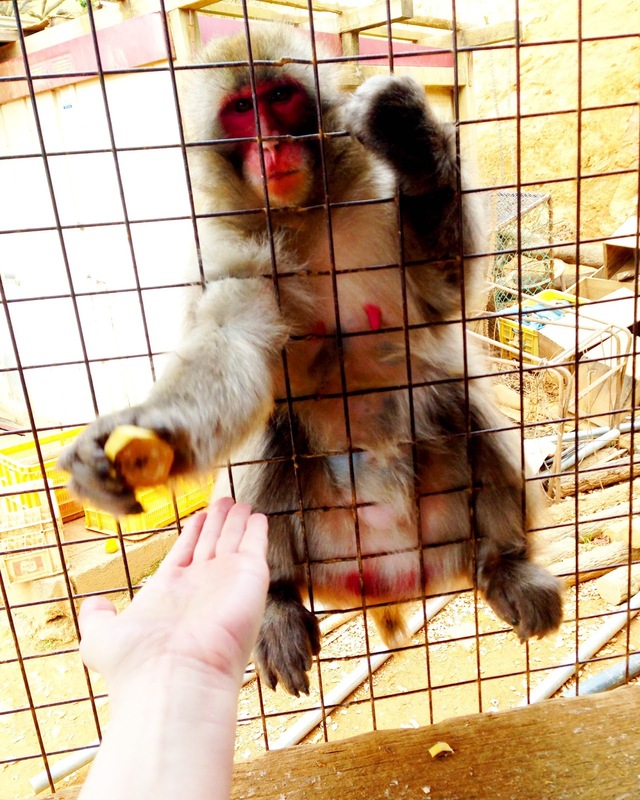 There is a large caged area which you can enter and buy food for the monkeys, for 100 yen a bag. The food included things like bananas and nuts. I bought so many bags! 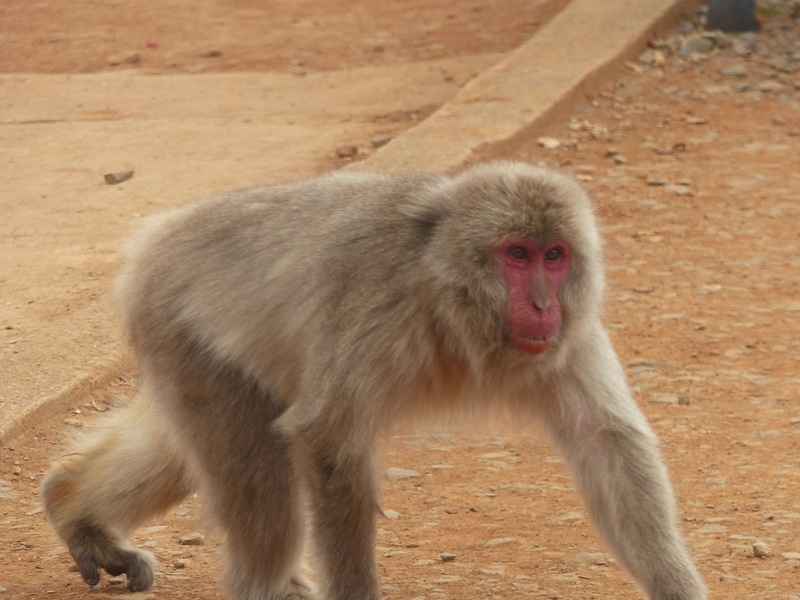 The monkeys were incredibly gentle taking the food, although very greedy. They would put their arm straight back out again as soon as they had shoved it in their mouths. I loved feeling their little hands and it was amazing to see them so close. I didn’t want to leave. 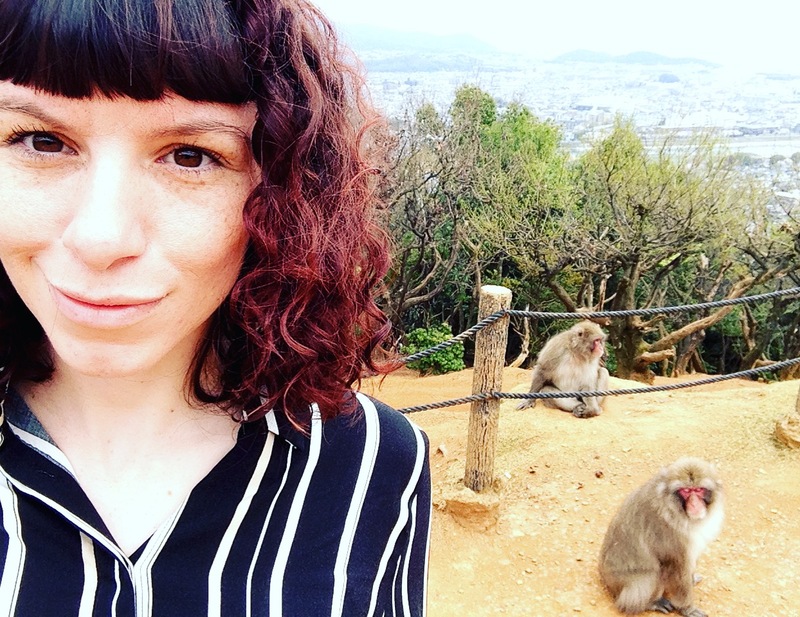 At one point a worker at the park shouted a Japanese word and all the monkeys came running, they understood it was dinner time. It was pretty cool! 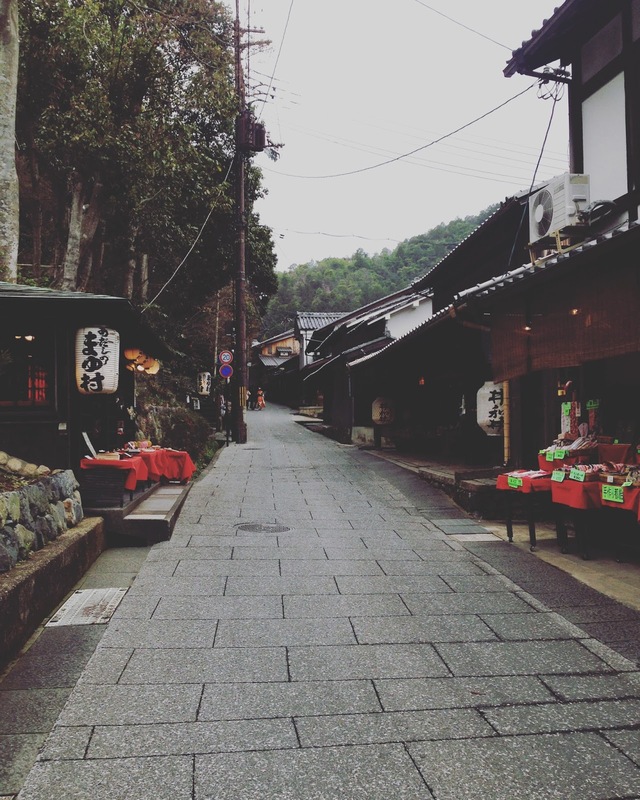 As we headed back down the mountain we noticed how incredibly busy Arashiyama had become. It was a sunday and it seemed like a lot of Japanese people were there with their family, enjoying the cherry blossom. As a consequence of the crowds we ended up skipping Tenryuji temple, the main temple of the area. Everything just seemed a bit too crazy around that area! 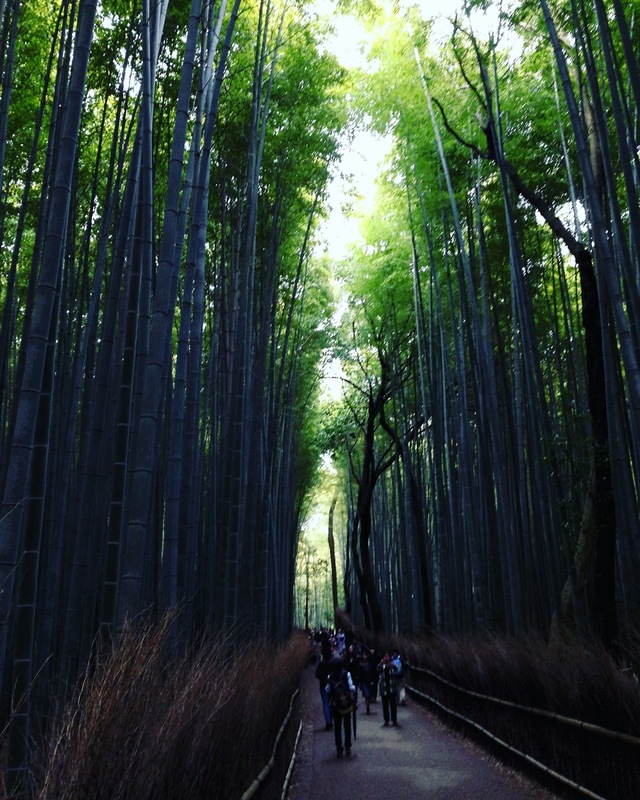 We continued to walk up through town and into the bamboo groves. It was a busy area but the groves were impressive and certainly worth viewing. We ended up in a much quieter part of town, with just a handful of people around. 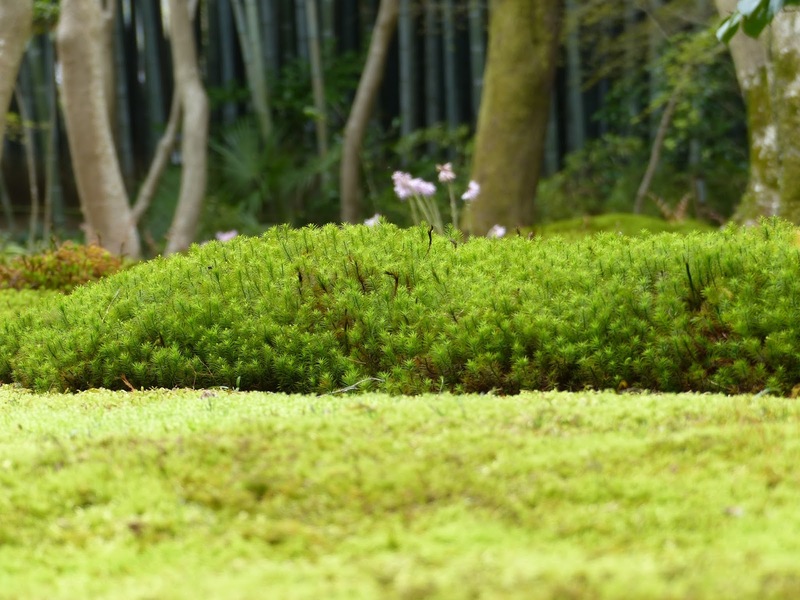 We went to the Gioji moss temple, which had a 300 yen entry fee. It felt really magical, as if faeries should live there. It was really one of my favourite places to visit. It was relatively tiny but the lack of tourists meant it was serene and calm. The area the temple sat in was lovely and traditional. It featured some very traditional shops, there were many selling silk worm cocoons and most shops we went in offered us green tea in a kind gesture. 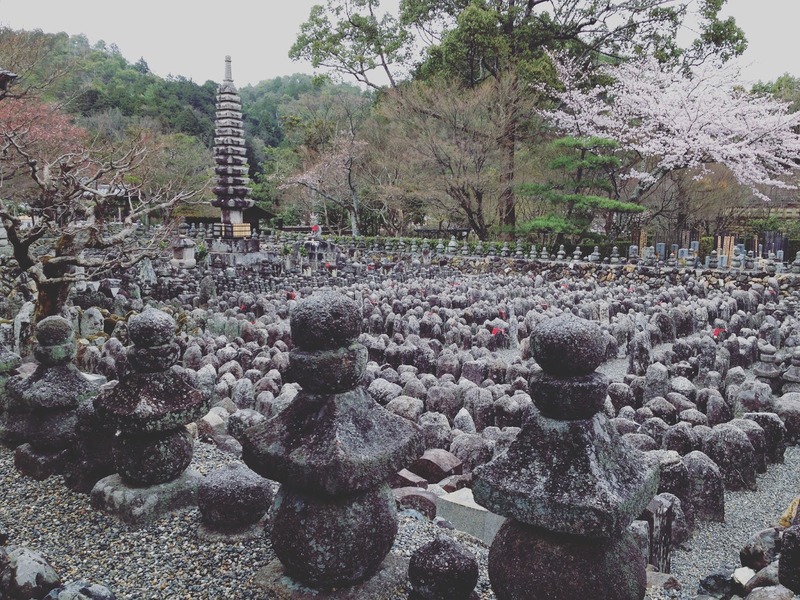 We ended up at the Adashino Nenbutsu-ji temple which is actually a graveyard with over 8000 buddhist statuesto symbolise the souls of the dead. The temple sits in an area where people used to abandon the bodies of the dead, quite morbid but interesting! 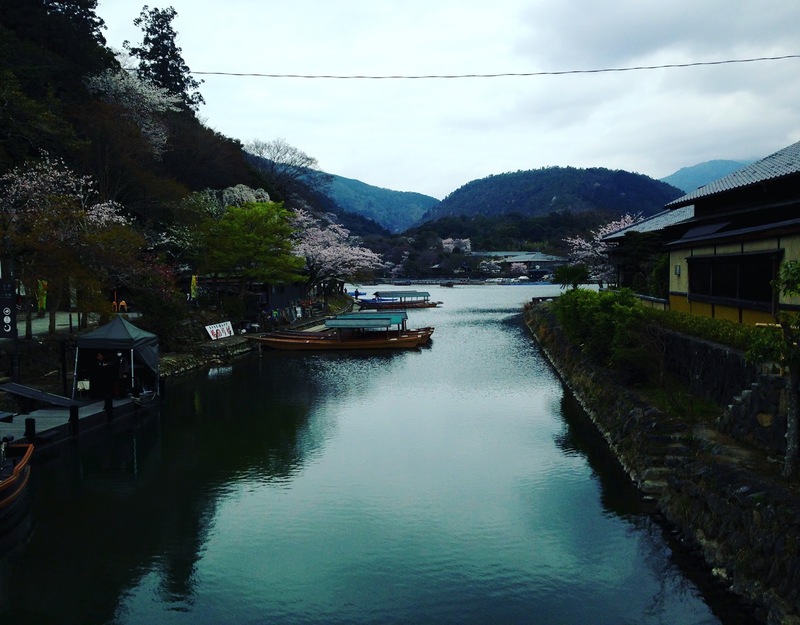 We decided to head back to central Kyoto but got quite confused at which station we needed to use, Arashiyama has quite a few so be mindful of that when you visit. In the end we jumped on the Hankyu line at Arashiyama station which was incredibly beautiful, had the most gorgeous trains! This evening we were very lucky to have tickets for Miyako Odori. Of course Geishas are such a part of Japanese culture but it’s very difficult to be able to enjoy them as they usually only take part in small private gatherings. 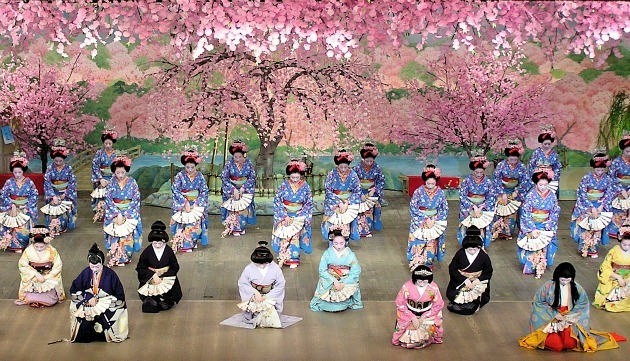 Miyako Odori is an annual festival where the geishas perform and show off their beautiful skills of dance and song. 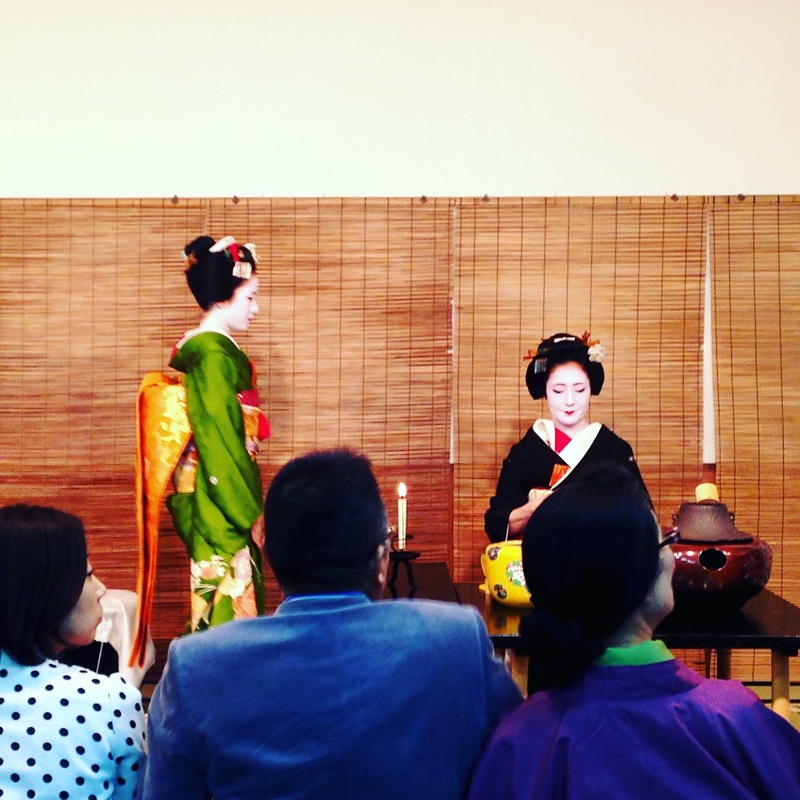 We decided to buy the top tier ticket so that we had a tea ceremony before the performance. 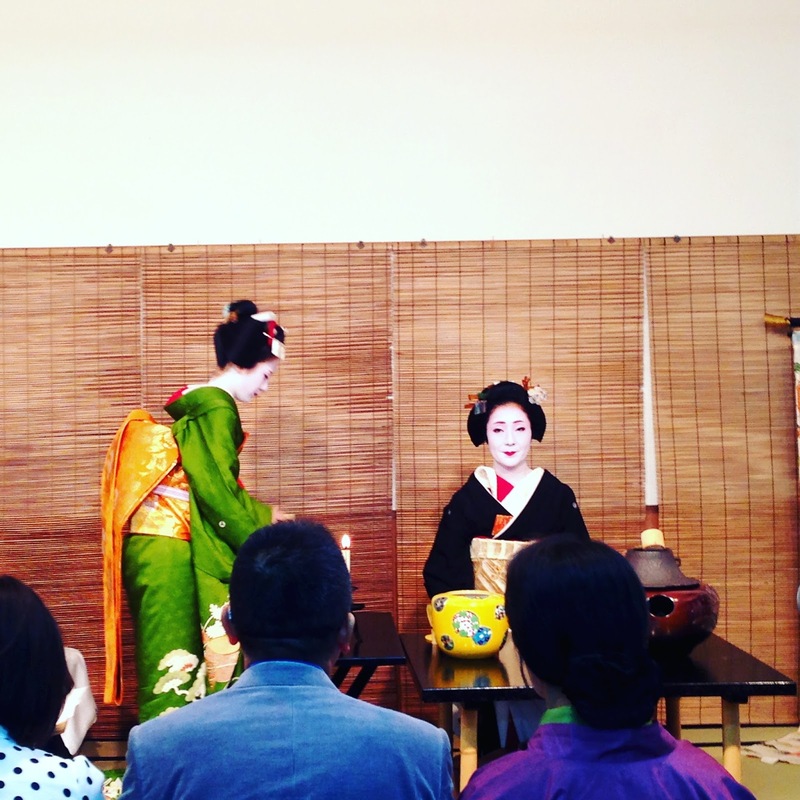 The tea ceremony was our only opportunity to take any pictures as there were no cameras allowed in the main theatre. We got a bowl of green tea (which I dislike) and a sweet, ‘manju’. I ate the boys sweets as they weren’t fans of the red bean paste it contained, we got to keep the plates that the sweets came on. The tea ceremony was a bit rushed and it was difficult to see the geisha as there were a lot of people in front of us but still, I’m glad we went. The main show was about an hour long and it was truly amazing. The above photo is not my own photo as we weren’t allowed to take any. The background scenery was really breath-taking and it was wonderful to experience such a traditional way of Japanese life. The geishas were so incredibly graceful. 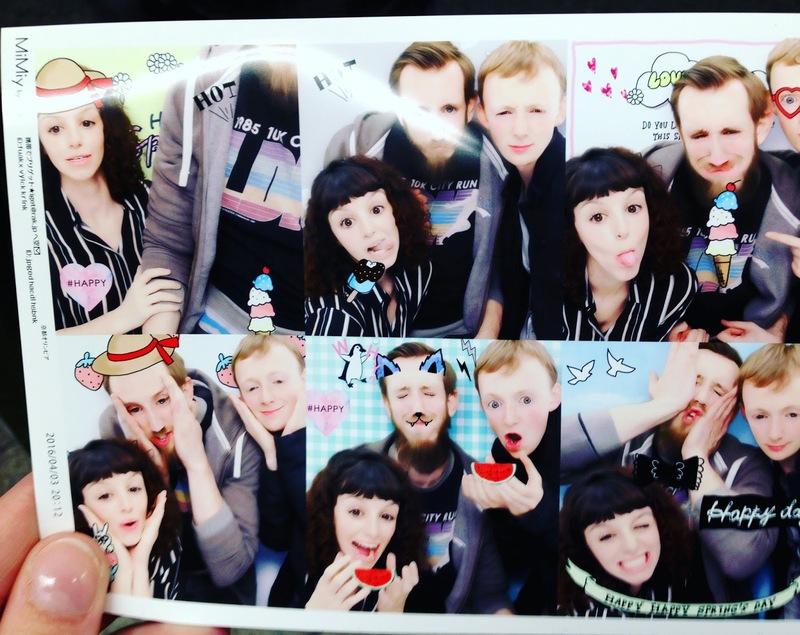 We walked back through the streets of Kyoto for our return and managed to find one of my favourite Japanese things, the photobooth! Such good souvenirs hehe.